Sixteen-year-old identical twins Melody and Harmony were separated at birth and have never met until the day Harmony shows up on Melody's doorstep. Up to now, the twins have followed completely opposite paths. Melody has scored an enviable conception contract with a couple called the Jaydens. While they are searching for the perfect partner for Melody to bump with, she is fighting her attraction to her best friend, Zen, who is way too short for the job. When Melody is finally matched with the world-famous, genetically flawless Jondoe, both girls' lives are changed forever. A case of mistaken identity takes them on a journey neither could have ever imagined, one that makes Melody and Harmony realize they have so much more than just DNA in common. From New York Times bestselling author Megan McCafferty comes a strikingly original look at friendship, love, and sisterhood--in a future that is eerily believable. 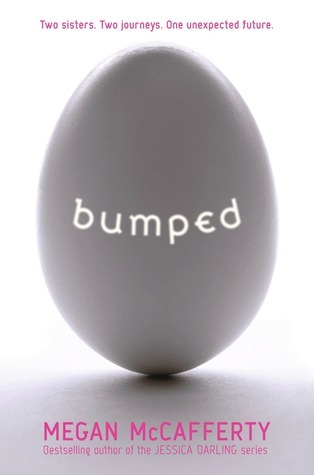 Yes, we’re doing Bumped (HAH!) It came out in the distant 2011 and is already lost in the giant shuffle pile of YA Dystopias that came out at the time, but I think it will generate some very interesting discussion, both because of how it lives up to and subverts Dystopia tropes (both classical and modern), and because… well, it’s very, very pertinent. Also, I adore Megan McCafferty and I think it’s a crying shame this didn’t get as much limelight as I wished it would have. There’s a lot of things I’d like to talk about, which is why, instead of the running commentary approach, I’ll summarise the chapters in each post and use select themes and quotes as springboard for discussion. #1: There will be SPOILERS! #2: There will be SPOILERS! #3: You don’t need to have read the book to participate in the discussion, but if you would rather go into it blind, my advice would be not to keep on reading. #4: Did I mention the spoilers? Yeah, those aren’t rules, so much as they are disclaimers, but there is really no way for me to do this without spoiling the plot. I want to celebrate this book, I want to celebrate my love for it and hopefully get others to appreciate it, if not as some genius commentary on current affairs, then at least as a discussion-worthy read. Also, Alex’s posts about Ender’s Game convinced me to pick the book up from the library, so there’s always hope that new readers might discover Bumped through this deconstruction as well. It’s a little late for me to get down to the first four chapters today, so instead, we’ll just take a quickie look at the structure. The United States of America once ranked above all industrialized nations in the realm of teen pregnancy. We were the undisputed queens of precocious procreation! We were number one before, and we can be number one again! Did you laugh? Come on, be honest! I sure laughed when I first read this. Megan McCafferty’s trademark humour is seeped into the narrative, but a closer look, and any subsequent reads, quickly reveal the reality that lurks under the smiles and jokes. This quote starts off as something you might have heard (or, indeed, you have heard), and then takes the opposite conclusion. Teen pregnancy isn’t a good thing right now, it should not be encouraged, and certainly not mentioned in the State of the Union Address in such a matter, and yet it is. The message is clear: This is not our world. You might also think that, based on the premise and the use of the word “Queens”, that this would be a world where women, and most notably teenage girls, would be in a position of undisputed power. Imagine! And yet, you see the last sentence, and you have to wonder. It’s not just a factual statement, it’s a call for battle. We can be number one again! As if it’s a competition, and indeed, the book tells us, it is. We will soon discover that the US of A is trying to keep up with China in terms of birth rates, and that teen pregnancies aren’t just accepted, they’re vital for the survival of the nation. In such a climate, how much real power can teen girls have?